ITIL 4 reflects the fast-paced and complex environment we live in, opening up ITIL to a wider range of professionals working in the world of digital transformation. 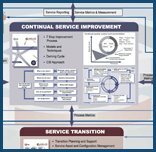 As ITIL 4’s entry-level certification, the Foundation course teaches you the key concepts of IT service management and gives you a grounding in the fundamental principles and terminology used in the framework. With our e-learning courses, you can study at a time and pace that suits you, with the full support of our ILX tutor panel.